The whole country is mourning for the passing of one of the fieriest yet admired senator that we ever had. 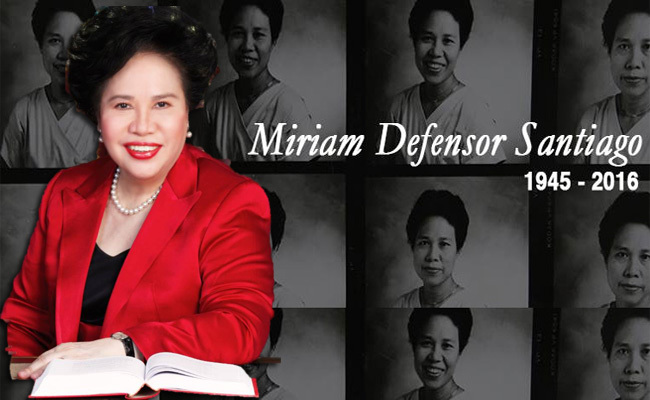 Miriam Defensor-Santiago sadly died in her sleep at exactly 8:52 am in St. Lukes Medical Center at age 71 years old. Her husband, Narciso Santiago confirmed the sad news in dzBB while the senator’s staff posted on her twitter page that Santiago died peacefully. During a hearing for Freedom of Speech Bill, Senator Grace Poe asked everyone at the Senate to pray for the soul of “Iron Lady of Asia“. Weeks before her passing, Santiago was admitted at the hospital due to complications. The three-term senator first announced that she was battling with stage 4 lung cancer last July 2, 2014. Despite being teary-eyed, she still cracked jokes with the reporters that she was excited having this disease but is optimistic that she can survive this battle. As of the moment, Santiago is on the top trending topic in twitter with hashtag #RIPMiriam. Most of the netizens send their condolences to her family and described the senator from Iloilo as “the best president we never had”. Santiago filed her candidacy for president for the 3rd time last October 2015 after learning that she was on a stable condition with Senator Bongbong Marcos as her running mate but she got less public appearances among her adversaries when she became physically weak. In the end, she lost to current President Rodrigo Duterte. After the elections, she announced that she will step down as a senator after her term will expire. After serving as a senator for 3 terms, she has a record of most number of bills filled at the Senate. Before Santiago became a senator, she was a former immigration commissioner, an agrarian reform secretary and a presiding judge at Quezon City Regional Trial Court.